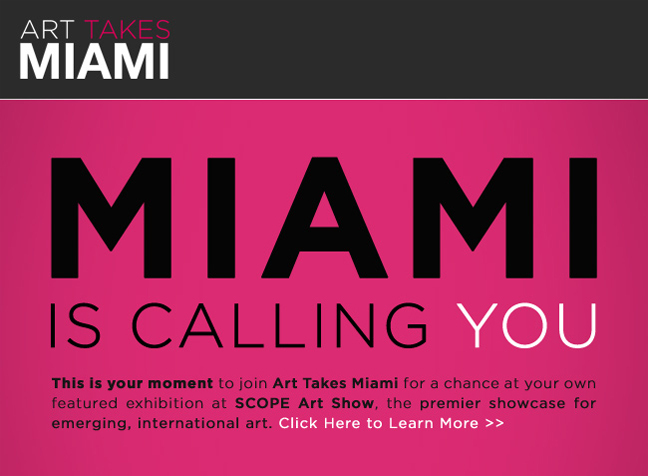 This is your moment to join Art Takes Miami for a chance at your own featured exhibition at SCOPE Art Show, the premier showcase for emerging, international art. Artists, where will you be when the heavy hitters of the art world are in Miami this December? SCOPE Art Show and See.Me invite you to join the 4th annual Art Takes Miami 2013, an international search for creative talent, skill and vision that will present one visionary in an exclusive, featured booth at SCOPE Art Show during the hottest art event of the year. More artists will be exhibited than ever before through the Miami Group Show which will present select participants in a special display at SCOPE Miami 2013.